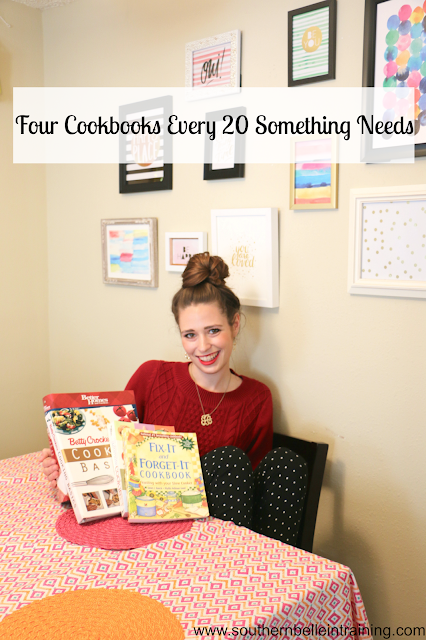 Four Cookbooks Every 20 Something Needs. I feel like I've been saying this on a weekly basis here on my blog since I graduated college, but by far the thing that I love the most about adult life so far is having my own kitchen at last, and getting to cook and bake to my heart's content. Spending time in my kitchen has become such a form of both creativity and stress relief for me, and I look forward each week to experimenting with new recipes and whipping up ones that are quickly becoming tried and true favorites. But despite being like every other 22 year old female who is Pinterest-obsessed, I have also inherited a certain trait from my mother: collecting cookbooks! My mom has shelves upon shelves of all types of cookbooks throughout our house, and I have fond memories when I was growing up of her rotating through different ones through different years and reading through pages and pages of recipes the way that others read novels. Like my mom, I also adore cookbooks and have from a young age. My mom has bought me many of the ones that I own- they were a popular Christmas present for me to receive growing up! But now that I'm older, I also enjoy buying and discovering them myself, and I proudly have a full shelf of cookbooks in my own little apartment. I definitely haven't had the opportunity yet to fully discover all of my cookbooks, and of course I keep buying more and more. #ofcourse But I thought it would be fun to share a little bit about four of the cookbooks that I have made several recipes from, and that I truly find to be staples in my kitchen! Better Homes and Gardens New Cookbook: This is essentially the bible of American kitchens. Almost everyone's house or apartment that I visit- whether back home in Maine, here in NC, (or anywhere really for that matter!) has a copy of this in the kitchen. If you've never seen the inside of this cookbook, it's organized very easily into tabbed sections for different types of main dishes, side dishes, and desserts. Some of the newer editions, like the the one that I have, feature pictures in beginnings of sections for some of the popular recipes. If there's any cookbook that you need to have - it's this one! Betty Crocker's Cooking Basics: One of my neighbors in Maine gave this cookbook to me for Christmas when I was in elementary school. I was already a proud owner of several kid's cookbooks, but this was one of my first grown-up cookbooks, and I was ecstatic! This cookbook will always be special to me because the memories that come along with it, but the recipes are great as well. It features many tried and true recipes for classic American favorites, and lots of comfort dishes. My two personal favorite recipes from this cookbook are the corn bread and apple crisp recipes - I made the apple crisp on a weekly basis for a lot of September and October this year! My roommate, who is not as big into cooking and baking as I am, has also really started to love this cookbook, and finds the recipes very easy to follow. She is a big fan of the meatloaf recipe. The Fix-It and Forget It Cookbook: During my first couple months of living on my own, I did most of my cooking in my roommate and I's Crock-Pot. Slow cooker meals are so easy to make, and most have really large portions, so they provide lots of leftovers! This is the quintessential Crock-Pot cookbook with all sorts of meals from soups to various meat and vegetarian main dishes, and even breakfast items and desserts! Do you have any favorite cookbooks? Please share them in the comments! Wishing you all a wonderful weekend! I am working for part of this weekend, but I also have some extra time which will be spent getting some holiday blog posts ready. Deeana and I are shooting early on Sunday morning- we've been doing Sunday shoots for the past couple of months and it's been working well. I'll try and post some behind the scenes pics on Snapchat and Insta Stories that day! Love these ideas! I'm going to put them on my wishlist for this Christmas! I have the fix it and forget it one! Otherwise, most of the rest of my recipes are from Pinterest! I usually look recipes up online as well, but I've always wanted to use a cookbook! I feel like it would just make me feel more adult? Lol I hope that makes sense! The forget it cookbook is my JAM! I'll have to check the others out! What a fun post! I love that you've been collecting cookbooks since you were little! I have two or three but mostly rely on Pinterest! I just added a few of these to my cart on amazon! My mom has the Better Homes and Gardens cookbook haha! Southern Living has awesome cookbooks too! I've had one of Ina Garten's cookbooks for years and I love it! I'll look into these. I dont really use cook books but if i did i would love to use some of those hehe!! I do have some of those in my house but i never read them! I should bring them out. Is it sad that I've never owned a cookbook before? I usually consult Pinterest but I think I need a hard copy! I'm definitely guilty of scrolling through Pinterest for recipes to never see it again! I'd love to have a physical copy of a cookbook available. Thanks for the recommendations! Just added the Fix It & Forget it cookbook to my Christmas list, that sounds like an awesome cook book :) I also highly recommend the Pioneer Woman cookbooks, I have three of them and they're favorites of mine! Styling White Jeans with OTK Boots. How to Survive Being Sick When You Live Alone. Black Friday Weekend 2016 - BEST SALES. 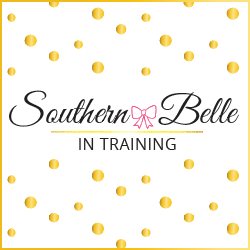 Thanksgiving Kate Spade + Tory Burch Sales! Kate Spade Purses ON SALE for under $150! Tips to Prepare For Holiday Road Trips. Holiday Gift Ideas for Blog Friends. My T-Shirt Quilt: My Favorite Graduation Present. 10 Ways (under $10) to Brighten Someone's Day. Fall Blogger Beauty Gifts Review.